AAlbums credited to Johnny Cougar. BAlbums credited to John Cougar. CThe Kid Inside was recorded in 1977. DAlbums credited to John Cougar Mellencamp. EThe Lonesome Jubilee also peaked at #63 on Top Country Albums. 1986 "R.O.C.K. In The USA (A Salute To '60s Rock)"
1986 "Rain On The Scarecrow"
1987 "I Saw Mommy Kissing Santa Claus"
1989 "Let It Out (Let It All Hang Out)"
1991 "Get A Leg Up"
1992 "Now More Than Ever"
1993 "When Jesus Left Birmingham"
1994 "Baby Please Don't Go"
1996 "Key West Intermezzo (I Saw You First)"
1998 "Your Life Is Now"
1999 "I'm Not Running Anymore"
Top 100 (Kent Music Report) peaks to June 19, 1988: Kent, David (1993). Australian Chart Book 1970–1992 (Illustrated ed.). St Ives: Australian Chart Book. p. 197. ISBN 0-646-11917-6. N.B. 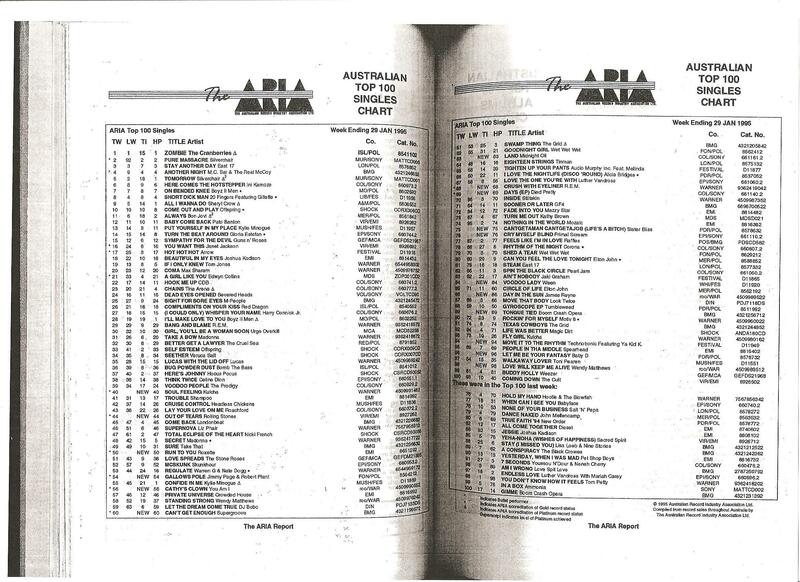 The Kent Report chart was licensed by ARIA between mid-1983 and June 19, 1988. ^ a b c Ryan, Gavin (2011). Australia's Music Charts 1988–2010. Mt. Martha, VIC, Australia: Moonlight Publishing. ^ Lwin, Nanda. Top 40 Hits: The Essential Chart Guide (2000). 1-896594-13-1. ^ Erlewine, Stephen Thomas. Unplugged Collection, Vol. 1 - Various Artists - オールミュージック. 2011年11月25日閲覧。.